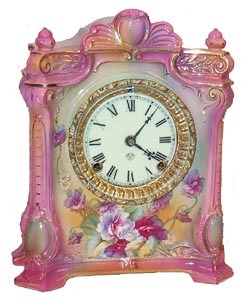 Ansonia Clock Co., Royal Bonn, porcelain clock, "LaSeine", ca 1915. This one is a beauty, primarily hot pink, with rose, white, yellow, and pink flowers, front and sides. The name, LaSeine and the Royal Bonn mark on the back of the case. 8 day, half hour gong strike, running just fine. Great porcelaindial, American sash, beveled glass, clean and polished inside and out. Caseis 11-1/2 inches high, 10 inches wide. A really pretty clock. Ly-Ansonia No. 2502.